This Wireless Weather Station replaced the broken atomic clock that was in my bathroom for several years. Named, Touch Weather, by Oregon Scientific, this particular wireless weather station was appealing to me for a couple of reasons: The picture on the box indicated a very bright, easy-to-read display and a small, attractive design. I really only wanted another atomic clock for getting ready for work in the mornings, but decided having a temperature gauge in the bathroom would be an equally good idea. Let me give you my opinion the features and functions of this particular unit. As the graphic on the box indicated, Touch Weather is a rather small, attractive unit with clear, easy-to-read, retro-like, LCD display. The unit is named, Touch because you can switch between In-Door and Outdoor temps simply by touching the screen. The first touch of the screen will illuminate the display. Touching it again will toggle you through the outdoor sensors, 1-3, then bring you to an indoor weather screen. 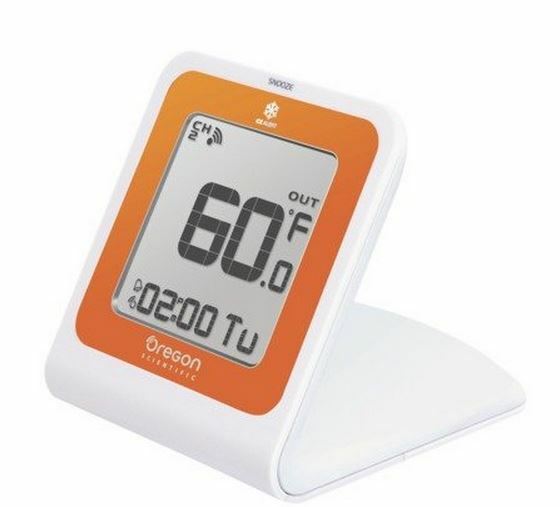 Both indoor and outdoor weather includes both temperature and humidity displays. There is also, of course, a self-setting, atomic clock and date which can be viewed by touching the digital read-out. Other features of Touch Weather include a minimum/maximum temperature record of indoor/outdoor temperatures and an alarm. Okay, so these features sound pretty good, but how well does the Touch Atomic clock actually work as a wireless weather station? The unit is attractive, small and takes up little room in the bathroom. The temperature readings have been very accurate thus far by comparison to my other wireless weather station in my den as well as the Weatherbug app. on my iPhone which uses a weather station just a couple of miles away. Having both indoor and outdoor humidity on such a small device is useful to me and it is easy to change between displays. The max/min temp/humidity is a good idea if actually worked. This brings me to my dislikes of the Touch wireless weather clock. Looks can be deceiving. The Touch Weather unit display is not nearly as bright and easy to read as indicated on the box and there is no way to adjust the brightness and contrast. One feature I forgot to mention is more of a nuisance than a benefit is called Ice Alert. When the temp drops below 32 degrees, a bright light flashes every few seconds illuminating the entire room. This is certainly not something you need when you are trying to sleep, but it sure is nice to know the temperature dropped 32 degrees which it always does in the late fall and winter nights of Colorado, right? Honestly, how do the marketing geniuses come up with hair-brained ideas like these? The manual and set-up of this device is horrible and I found it particularly difficult to get it to set the time on its own. The instructions led me to believe I would have to manually set it, with little mention to what the little RC button does which undoubtedly picks up the clock setting. Unfortunately, the clock failed to set properly to standard MST. I had to move it back an hour. Perhaps, the worst thing about Touch Weather is that certain features don’t work at all. When I attempt to view the MAX and MIN temps, for example, only half of the display lights-up. The outdoor humidity never registered a number at all; I am only able to view two, underscores. Finally, it is extremely annoying that the screen transmits a loud, audible beep when you press it. Did anyone from Oregon Scientific think of the fact that someone else in the room might be sleeping when you press the screen to view temperature readings? Last, but not least, this unit cost $40.00 at Target which is way over-priced for such a basic device that probably cost less than $5.00 to make. Sadly, this was an impulse buy. The box states this is only available at Target, but a quick Google search shows it is available on Amazon for $19.95.. At that price, even with drawbacks, the Touch Wireless Weather Station is a reasonable buy.